With Syria and the Fed grabbing most of the headlines in the last few days, I wonder how many people have emerging markets currencies at the top of their list of concerns. I am guessing few are poring over the likes of India (EPI), Indonesia (EIDO), Brazil (EWZ), Turkey (TUR), South Africa (EZA), Thailand (THD) and the Philippines (EPHE) on a daily basis. As a matter of fact, I would bet that very few people even know that there is an ETF dedicated to the Philippines. While keeping an eye on country-specific equities is important, it is currency movements that are at the heart of the emerging markets problem right now. Of course, the issue with currencies is really little more than a downstream effect of rising interest rates in the U.S., which is a result of changing expectations about the Fed’s quantitative easing (QE) program. Since December 2008, the Fed has used a variety of policy instruments to keep interest rates as low as possible in the U.S. and has effectively driven capital to emerging markets, where higher-yield investments looked more attractive. As QE begins to unwind, the supply of easy money in emerging markets has suddenly come to a halt and countries with large current account deficits and loans denominated in dollars (which will be repaid in a local currency that is rapidly declining in value) are particularly vulnerable. In the chart below I show the yield in the 10-Year U.S. Treasury Note (UST10Y) in the black line, along with a ratio of the Indian Rupee to the U.S. dollar (ICN:UUP) in orange, as well as a ratio of the Brazilian Real to the dollar (BZF:UUP) in green. Now these are a roll-your-own ratio of ETFs to ETFs rather than the exact currency crosses, but the charts are almost identical (and easily constructed at StockCharts.com), while the key takeaways are necessarily the same. Note that until May, ICN and BZF relative to the dollar appeared to be more positively correlated to U.S. interest rates than negatively correlated. As soon as interest rates began to rise at the beginning of May, both ICN and BZF began to rapidly lose ground against the dollar and the negative correlation with U.S. interest rates suddenly became very strong. One last point worth noting is that the BZF:UUP ratio has seen a bounce during the course of the last week, while the ICN:UUP ratio continues to deteriorate, as there has been little to suggest that the Indian Rupee is stabilizing, even as Brazil improves somewhat. For those who are interested in evaluating the risk and uncertainty in emerging markets in general, the recent VEXXM as a Measure of Emerging Markets Volatility and Risk is recommended reading for some background and information on VXEEM, the CBOE Emerging Markets ETF Volatility Index. The monthly VIX futures and options expiration is a fascinating time from an options strategy perspective, as it marks the point in time in which VIX futures prices collide with the cash/spot VIX. Thanks to the VIX Special Opening Quotation (SOQ), that price collision is an inexact one, but for all practical purposes, the VIX front month futures and cash/spot index converge once every month, just after the open on a Wednesday thirty days before the standard monthly option in the S&P 500 Index options the following month. To make things more interesting, the last day of trading for the front month VIX futures and options is the Tuesday session just prior to expiration. All these product attributes make it difficult to navigate the complex waters of the VIX product platform just prior to expiration, but because the VIX is capable of such sudden sharp moves [see VIX All-Time Spike #11 (and a treasure trove of VIX spike data) for some details,] options prices have to include the possibility of a sudden VIX spike right up until the moment of expiration. For these reasons, it is sometimes possible to sell VIX options for a surprisingly high premium right before expiration. In the graphic below, I have captured some data from the TD Ameritrade/thinkorswim platform that shows the prices of various VIX calls as of about 2:00 p.m. ET that expire tomorrow, with just more than two hours of trading left in these products. For comparison purposes, I have also included the September options for the same strikes, which will expire on September 18th. For the record, at the time of this snapshot, the VIX was at 14.48 and the August VX futures (now available on the TD Ameritrade/thinkorswim platform as ticker /VXQ3) were at 14.43. Note that the TD Ameritrade/thinkorswim platform includes information on the implied volatility calculated for these VIX calls as well as the estimated probability that these will expire out-of-the-money on September 18th. Theoretically at least, the VIX August 25 calls have a more than 1% of expiring in-the-money at tomorrow’s open, while there is more than a 5% chance that the VIX September 25 calls will expire in-the-money. 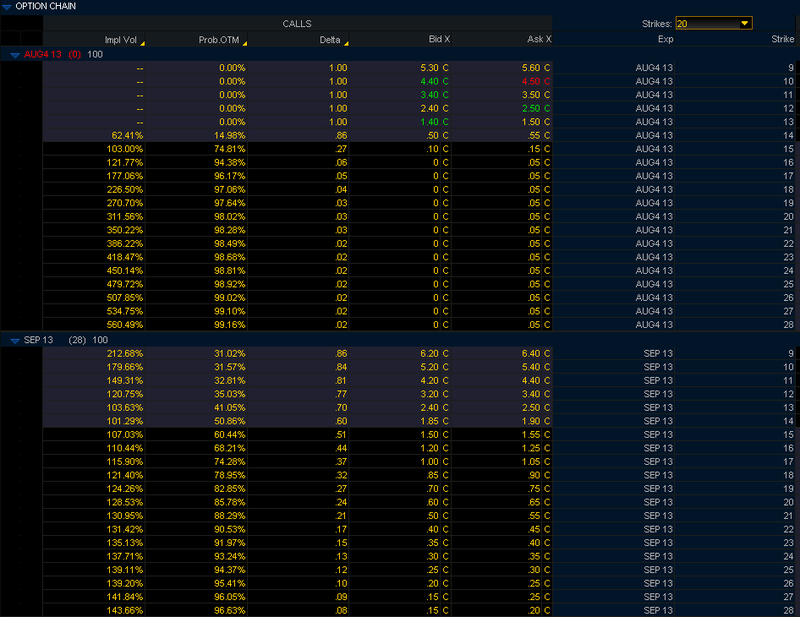 With an implied volatility of 139%, the VIX September 25 calls are currently bid-ask at 0.25 – 0.30. I am not recommending selling VIX calls just prior to expiration and I certainly would want anyone who is interested in these type of trades to start out with defined risk trades (e.g., bear call spreads) before considering trades with unlimited risk...but the possible trading opportunities are fascinating, to me at least. For those interested in additional background on the VIX expiration and some potential trade ideas, the posts below should provide a good jumping off point. I can’t remember the last time that the S&P 500 index pulled back a little from a recent high and I did not get at least one request to update the table below. The last time I did this, just two months ago in All About the Pullback from SPX 1687, I also threw in a scatter plot and trend line to help compare all the pullbacks since the March 2009 low. This time around I think the table with the raw data will suffice; those in need of a graphical plot can always click through the link above. It is worth noting that this is the fourth pullback of 2013 and even with the year less than two thirds over, there have been more pullbacks in 2013 than in each of the last three years. The corollary is that the magnitude of the pullbacks for 2013 has been relatively mild, with a 7.5% jolt from May through June pacing three pullbacks that were barely significant enough to warrant inclusion in the table. In contrast, each of the previous three years has seen one pullback of more than 10% – a threshold that usually triggers the “correction” label. Finally, while I have not included any VIX data in this table, I find it interesting that the VIX has yet to rise above 15 during this pullback. 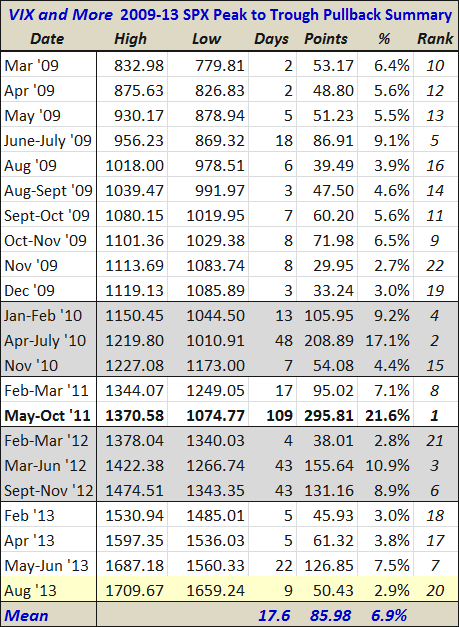 In every other instance cited in the table, the VIX managed to climb above 18 at least once. Last month I wrote a guest column for The Striking Price on behalf of Steven Sears at Barron’s, entitled: How to Spot Risk Early. That column has received a fair amount attention and yesterday it landed me on Fox Business with Gerri Willis of The Willis Report in a segment with the title, How to Foresee Trouble in the Markets. I should point out that this was the first time I have done an interview via a remote studio link and the experience was a little unsettling, sitting in a dark room staring off into the blackness while being assaulted by two huge spotlights that seemed as if they could illuminate an entire baseball field for a night game. Without the benefit of a monitor of having any idea what the feed looked like, I found myself talking to a voice inside my head staring into the darkness with absolutely zero idea what the feed might look like on TV. Fortunately the result was not as bad as I had feared. Please note that going forward I will no longer be publicly updating performance data for EVALS or for the Stock of the Week due to a variety of factors related to the launch of my new investment management business. I will continue to offer the newsletter, which will still include the Stock of the Week selection; I will also continue to offer the EVALS model portfolio service and will be pleased to discuss current performance data privately. As soon as the launch of my new investment management business is finalized, I will highlight some of the particulars in this space. 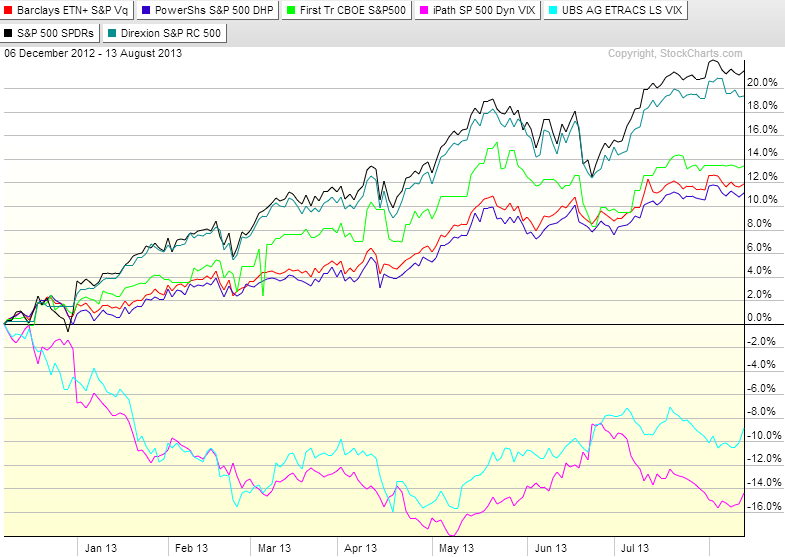 Posting on the VIX and More blog should not be affected by any of these changes. In fact, I pledge to resume a more regular posting schedule in the weeks and months ahead.